Every eye in the throne room rested on Ruby. 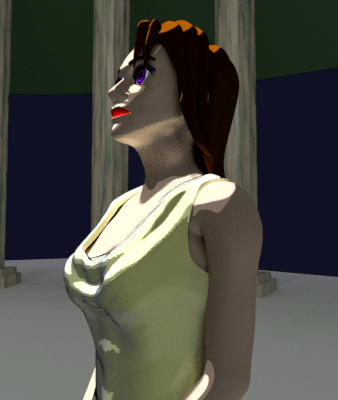 She felt tiny, standing alone at the foot of the dais steps, the weight of attention crushing down on her. Reluctantly, she met the eye of the king. "Don't be afraid," King Basha said. "I know you have only met the truth knight two days ago, and you do not share her quest." "Her quest?" Ruby whispered. Montrose had no intention of harming Basha. She only wanted to learn the truth about him. Ruby on the other hand, had come to save the world from this man. If anyone had a quest to kill Basha, it was her. "I... don't know what to say," Ruby said. "How much do you know already?" Basha frowned, but his eyes were playful. "You know, it's bad form to answer a king's questions with more questions." "It's forgivable. You have reason to be cautious. You were sent to this city with no prior knowledge of your significance, given a task you couldn't possibly understand. The daughter of one of our finest seers told you that you represent hope for the world. I agree with her. But her father taught her to mistrust me, and she passed that mistrust on to you. I don't blame young Hera for what she told you. Her father Argolese was an imposing man to be certain, and despite my personal admiration for him, he set himself against me. You, unfortunately, are caught in the middle of a conflict based entirely on a misunderstanding." Ruby stared up at him, shocked. He knew about Hera? He knew why she'd come? King Basha smiled. "You've come here to save my city, and for that, I applaud you. Saving this city is what I want as well." "Of course. It's all I've ever wanted. So you see, we are allies." Ruby stammered, lost for words. Then she thought of the footage she'd seen of Mai, escorted in chains through the city. "What about your prisoners... the people you plan to sacrifice?" Basha nodded, growing sorrowful. "Of course that would upset you. I don't expect you to believe it, but it upsets me as well." "Then don't do it. Don't kill them. Let them go." "It might cheer you to learn that I will do just that... at least for most of the prisoners." "I take no pleasure in senseless killing. I will not sacrifice one more soul than is necessary to transform this world. My Ord priests have been overzealous in their search for vessels capable of fueling the world transformation. I have much more than I need. If there is someone you would like to see freed, I will release them to you." Dar'ja now stood beside Jarrock on the dais. At King Basha's words, the little man took a sharp breath. He leaned and whispered to Jarrock who frowned and leaned over to whisper in Basha's ear. Basha whispered back. Jarrock scowled. Another brusque word from Basha dismissed him. "My Ord guard have reservations about releasing anyone before the day of transformation. They have been faithful servants, and I do not wish to dishonor them. Perhaps if you give me a name, I can negotiate the release of one individual for now. "Mai Martin," Ruby said. "And there's a Vayna woman..."
"Mai Martin," Basha cut her off. "Describe her." "I'll do what I can. But be patient. These last few days before the transformation will require a delicate hand. Tensions are high in my city. Despite my promises, there are those who doubt. People fear the worst, and I look forward to allaying that fear." 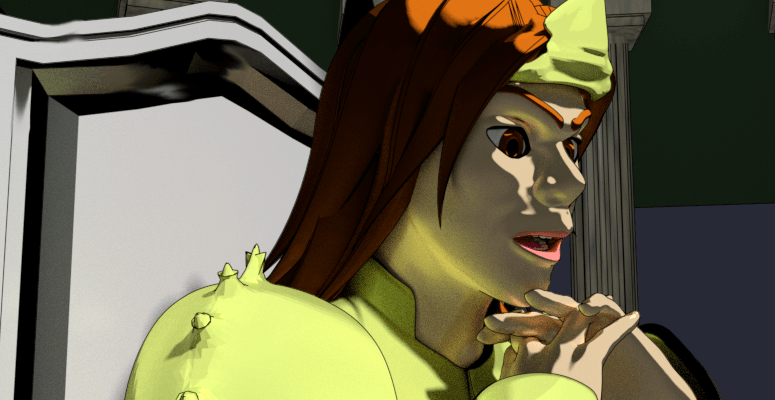 Ruby wanted to ask why things had failed the first time Basha tried to transform the world. She wanted to ask why they killed Argolese. She wanted to ask why the world needed transforming at all. There were so many things wrong with what this man was saying, and yet his benevolent smile disarmed her. "Why do you care what I think?" she asked. "Why do you want to help me?" Basha spread his hands. "You are the Lady of Hope." "I thought the statue I resemble was called Lady Chaos." "It was. But no longer. The world has seen enough chaos. Argolese himself said you were a symbol of hope. And so you shall be." 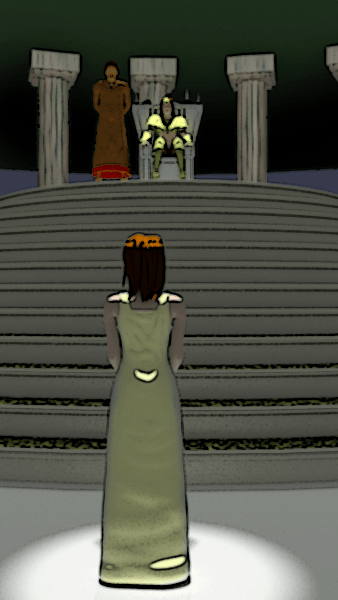 The imposing Jarrock leaned over the throne towards the king and whispered a word. Basha nodded. "I am sorry, Miss Tanner, but I have urgent matters elsewhere. I am told you have a full day ahead of you." Basha stood and pulled the cape over one shoulder. "A tour of Cavaheim. I trust it will be fascinating. He turned to follow the Ord priest behind the dais, then stopped and turned back. And Miss Tanner, would you be my guest for dinner tonight?" Ruby gaped. "Me? Uh, sure." Dar'ja looked shocked. He whispered with Jarrock. "Splendid," Basha said. "I look forward to it." Ruby remained at the foot of the stairs, staring up at the empty throne. Tachma led Ruby back to her room. "What did they do to Montrose?" Ruby asked as the palace manager showed her to her door. "It is of no concern to you, Miss Tanner." "For now, Lady Montrose is in the dungeon." Tachma smirked, the first hint of emotion Ruby had seen on the woman's face. "No doubt, you imagine a horrible pit full of stone and filth. But this palace was once a shrine to learning. We have no such horrors here. Before Basha moved in, it was simply referred to as the basement. The dungeon is a converted auditorium. Much of it is carpeted." "Oh. Can I see her?" Tachma pulled Ruby's door open. "That is up to His Highness. For now, you should content yourself with a tour of the city." "Do I have to go dressed like this?" "No. There is a much more suitable pair of shoes in your dressing chamber." "What about my old shoes?" Tachma's face flared with disgust. "Those old shoes were held together with a few threads and a lot of filth. I had them destroyed upon your arrival, along with the rest of your clothing." "What? Even my T-shirt?" Ruby had loved that shirt, even if it was threadbare after weeks in the woods. "We can provide you with everything you need. Fear not, Miss Tanner." Tachma stopped at the door. "I'll leave you to freshen up. An attendant will arrive to show you the city in a half hour." Without another word, Tachma left. Ruby stood shivering. She had to go outside? She should have at least asked for a coat to hide her bare shoulders. It wasn't cold out. In fact, it was exceptionally warm for mid-autumn. What day was it? Ruby hadn't stopped to wonder in weeks. Was it late October? Early November? Did the new world follow the old pattern of seasons? Did the volcanic energy under the caldera keep this valley warm? She wondered about the weather as she wandered into her bathroom. She stopped inside when she spotted the box with the note. It was a black box, about the size that might contain a wedding ring. Ruby took the note and opened the box. Inside was a pale-pink nub of plastic, a few holes on one rounded end and a few others on the opposite, flat side. A thin filament of thread hung from the edge. Ruby turned the tiny device over in her fingers, trying to understand its purpose. She set it back in its box and read the note. You are not alone. You wish to save the city from Ord oppression. That is our goal as well. We will soon call on you to help us. There is a cloak tucked under your mattress that might also come in handy. It's dyed in an ultraviolet pigment that will confuse the Ord's surveillance technology. Keep it secret until it's needed. Stay safe and play along with your handlers. Changes are coming. Today, many of the Ord have gone to rescue a comrade in the south. When they return early tomorrow morning, they will be weary. At dawn, we will attack. Be ready. Ruby read the note twice. "Be ready for what?" she muttered to herself. "What am I supposed to do? And who is Elric?"